The building of Uffizi complex was begun by Giorgio Vasari in 1560 for Cosimo I de' Medici so as to accommodate the offices of the Florentine magistrates, hence the name uffizi, "offices". The construction was later continued by Alfonso Parigi and Bernardo Buontalenti; it was completed in 1581. The top floor was made into a gallery for the family and their guests and included their collection of Roman sculptures. The cortile (internal courtyard) is so long, narrow and open to the Arno at its far end through a Doric screen that articulates the space without blocking it, that architectural historians treat it as the first regularized streetscape of Europe. Vasari, a painter and architect as well, emphasised its perspective length by adorning it with the matching facades' continuous roof cornices, and unbroken cornices between storeys, as well as the three continuous steps on which the palace-fronts stand. The niches in the piers that alternate with columns of the Loggiato filled with sculptures of famous artists in the 19th century. The Uffizi brought together under one roof the administrative offices and the Archivio di Stato, the state archive. The project was intended to display prime art works of the Medici collections on the piano nobile; the plan was carried out by his son, Grand Duke Francesco I. He commissioned the architect Buontalenti to design the Tribuna degli Uffizi that would display a series of masterpieces in one room, including jewels; it became a highly influential attraction of a Grand Tour. The octagonal room was completed in 1584. Over the years, more sections of the palace were recruited to exhibit paintings and sculpture collected or commissioned by the Medici. For many years, 45 to 50 rooms were used to display paintings from the 13th to 18th century. Because of its huge collection, some of the Uffizi's works have in the past been transferred to other museums in Florence—for example, some famous statues to the Bargello. A project was finished in 2006 to expand the museum's exhibition space some 6,000 metres2 (64,000 ft2) to almost 13,000 metres2 (139,000 ft2), allowing public viewing of many artworks that had usually been in storage. The Nuovi Uffizi (New Uffizi) renovation project which started in 1989 was progressing well in 2015 to 2017. It was intended to modernize all of the halls and more than double the display space. As well, a new exit was planned and the lighting, air conditioning and security systems were updated. During construction, the museum remained open, although rooms were closed as necessary with the artwork temporarily moved to another location. For example, the Botticelli rooms and two others with early Renaissance paintings were closed for 15 months but reopened in October 2016. The major modernization project, New Uffizi, had increased viewing capacity to 101 rooms by late 2016 by expanding into areas previously used by the Florence State Archive. The Uffizi hosted over two million visitors in 2016, making it the most visited art gallery in Italy. In high season (particularly in July), waiting times can be up to five hours. Tickets are available on-line in advance, however, to significantly reduce the waiting time. A new ticketing system is currently being tested to reduce queuing times from hours to just minutes. The museum is being renovated to more than double the number of rooms used to display artwork. On 27 May 1993, the Sicilian Mafia carried out a car bomb explosion in Via dei Georgofili and damaged parts of the palace, killing five people. The blast destroyed five pieces of art and damaged another 30. Some of the paintings were fully protected by bulletproof glass. The most severe damage was to the Niobe room and classical sculptures and neoclassical interior (which have since been restored), although its frescoes were damaged beyond repair. In early August 2007, Florence experienced a heavy rainstorm. The Gallery was partially flooded, with water leaking through the ceiling, and the visitors had to be evacuated. There was a much more significant flood in 1966 which damaged most of the art collections in Florence severely, including some of the works in the Uffizi. ^ a b "Official Italian visitor figures, 2016" (PDF). ^ Top 100 Art Museum Attendance, The Art Newspaper, 2014, p. 15. Retrieved on 25 July 2014. ^ "Uffizi Gallery Tickets - Museums Tickets Florence Uffizi Gallery". www.florence-museum.com. ^ "L'Esperienza dei primi diretorri dei musei autonom". www.beniculturali.it. 13 November 2017. ^ "History of Uffizi Gallery". www.uffizi.com. ^ "Tribuna :: Hall n. 18 ► Virtual Uffizi". Virtual Uffizi Gallery. ^ a b "Uffizi Gallery Tickets - Museums Tickets Florence Uffizi Gallery". www.florence-museum.com. 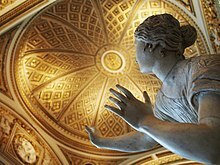 ^ "Discover the New Halls at Uffizi". Virtual Uffizi Gallery. ^ "History". uffizi.org. Archived from the original on 2015-07-04. ^ "New Uffizi: The Botticelli & Early Renaissance Rooms Reopen". uffizi.org. 19 October 2016. ^ a b "New Uffizi: The Botticelli & Early Renaissance Rooms Reopen". 19 October 2016. ^ Squires, Nick (12 October 2018). "Uffizi gallery, Florence: Queuing times cut from hours to minutes with new system". ^ Cowell, Alan (28 May 1993). "Bomb Outside Uffizi in Florence Kills 6 and Damages Many Works" – via www.nytimes.com. ^ "Why Florence still lives in fear of the flood". The Independent. 3 November 1996. Wikimedia Commons has media related to Uffizi and Uffizi Gallery.